Fluent is Vapor’s ORM or object relational mapping tool. It’s an abstraction layer between the Vapor application and the database, and it’s designed to make working with databases easier. Using an ORM such as Fluent has a number of benefits. The biggest benefit is you don’t have to use the database directly! When you interact directly with a database, you write database queries as strings. These aren’t type-safe and can be painful to use from Swift. Fluent benefits you by allowing you to use any of a number of database engines, even in the same app. Finally, you don’t need to know how to write queries since you can interact with your models in a “Swifty” way. Models are the Swift representation of your data and are used throughout Fluent. Models are the objects, such as user profiles, you save and access in your database. Fluent returns and uses type-safe models when interacting with the database, giving you compile-time safety. 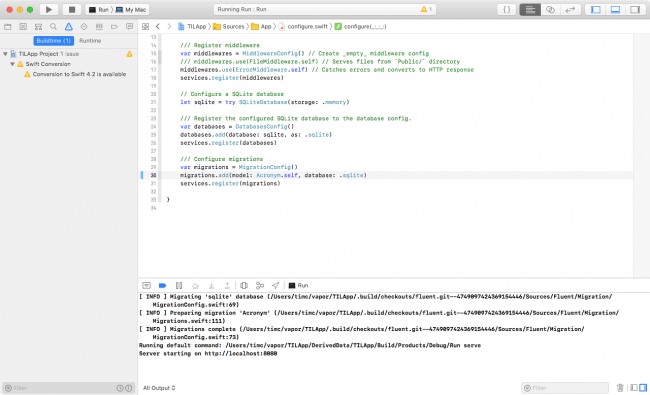 In this tutorial, you’ll learn how to use Fluent to save data in Vapor applications. 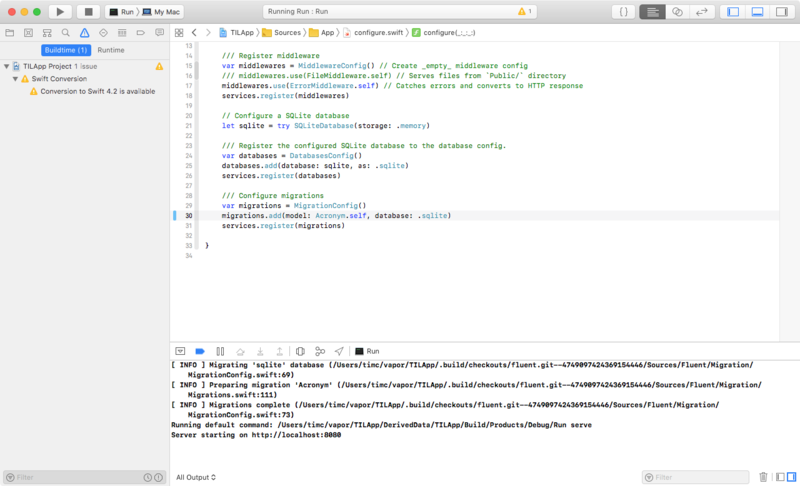 The first command takes you into a directory called vapor inside your home directory and assumes that you completed the steps in the “Getting Started with Server-side Swift using Vapor” tutorial. 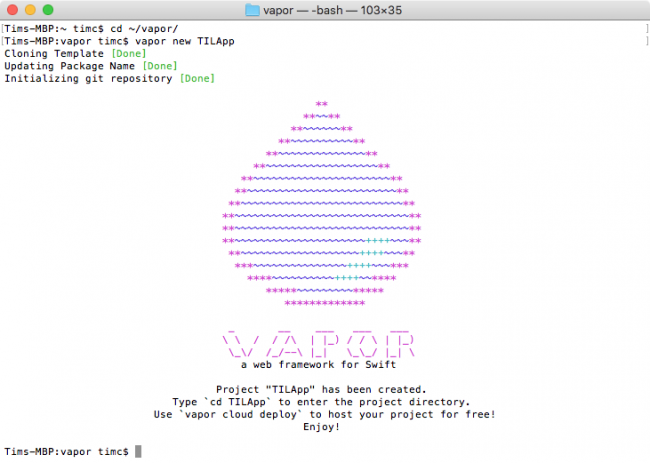 The second command creates a new Vapor 3 project called TILApp using the default template. This will open the project in Xcode. This removes the remaining references to the template’s example model and controller. The model contains two String properties to hold the acronym and its definition. It also contains an optional id property that stores the ID of the model, if one has been set. All Fluent models must conform to Codable. It’s also good practice to mark classes final, where possible, as it provides a performance benefit. The ID is set by the database when the acronym is saved. Tells Fluent what database to use for this model. The template is already configured to use SQLite. Tells Fluent what type the ID is. Tells Fluent the key path of the model’s ID property. The Fluent packages provide Model helper protocols for each database provider so you don’t have to specify the database or ID types, or the key. The SQLiteModel protocol must have an ID of type Int? called id, but there are SQLiteUUIDModel and SQLiteStringModel protocols for models with IDs of type UUID or String. If you want to customize the ID property name, you must conform to the standard Model protocol. To save the model in the database, you must create a table for it. Fluent does this with a migration. Migrations allow you to make reliable, testable, reproducible changes to your database. They are commonly used to create a database schema, or table description, for your models. They are also used to seed data into your database or make changes to your models after they’ve been saved. That is all you need to do! Fluent infers the schema for your model thanks to Codable. For basic models you can use the default implementations for Migration. If you need to change your model later or do more complex things, such as marking a property as unique, you may need to implement your own migrations. Fluent supports mixing multiple databases in a single application, so you specify which database holds each model. Migrations only run once; once they have run in a database, they are never executed again. It’s important to remember this as Fluent won’t attempt to recreate a table if you change the model. When your app’s user enters a new acronym, you need a way to save it. In Swift 4 and Vapor 3, Codable makes this trivial. Vapor provides Content, a wrapper around Codable, which allows you to convert models and other data between various formats. This is used extensively in Vapor. Register a new route at /api/acronyms that accepts a POST request and returns Future. It returns the acronym once it’s saved. 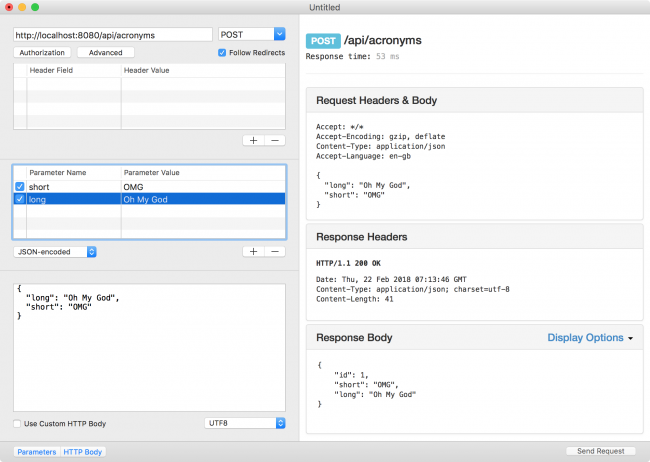 Decode the request’s JSON into an Acronym model using Codable. This returns a Future so it uses a flatMap(to:) to extract the acronym when the decoding completes. In this route handler, you’re calling decode(_:) on Request yourself. You’re then unwrapping the result as decode(_:) returns a Future. Save the model using Fluent. This returns Future as it returns the model once it’s saved. Fluent and Vapor’s integrated use of Codable makes this simple. Since Acronym conforms to Content, it’s easily converted between JSON and Model. This allows Vapor to return the model as JSON in the response without any effort on your part. Build and run the application to try it out. A good tool to test this is RESTed, available as a free download from the Mac App Store. Other tools such as Paw and Postman are suitable as well. Setting the parameter encoding to JSON-encoded ensures the data is sent as JSON. It’s important to note this also sets the Content-Type header to application/json, which tells Vapor the request contains JSON. If you’re using a different client to send the request, you may need to set this manually. You can download the final project for this tutorial with the Download Materials button found at the top and bottom of this page. This tutorial has introduced you to Fluent, and how to create models in Vapor and save them to a database. If you enjoyed this tutorial, why not check out our full-length book on Vapor development: Server Side Swift with Vapor?